Who owns your garden? This may seem like a stupid question, but I am not talking about legal ownership, rather moral ownership within your family. But before you answer that question, let’s try a couple more – hopefully easier – questions. Is your dog house trained? Assuming he is, then you have taught him that it is not acceptable to soil in the house, but that it is acceptable outside. Dogs understand that different rules can apply in different locations. Who owns your house? You will have made certain decisions (whether you realise it or not) as to what is acceptable behaviour from your dog in your house. Your dog knows whether or not he is allowed on the sofa or bed, whether he is allowed to lick the plates in the dishwasher and any other rules that you have in your house. You have made decisions (which could be unintentional) as to what you will allow, and your dog knows this. You have decided what your dog should or should not be allowed to chew in the house – his toys are acceptable, but presumably electric cables are not. So, let’s go back to the original question – who owns your garden? Many people open the back door and let the dog out to relieve itself and go back into the house. They do not own their garden – they hand control of the garden over to their dog and then are surprised when their dog does what it wishes. This was brought home to me recently when a dog was staying with us for a few days. She had no reason to think that she did not own our garden, I hadn’t explained the situation to her. It was winter and I have not been outside as much as I usually am. She spent a great deal of time outside, much more than my own dogs. On one such occasion, I decided that she had been outside long enough and went out to look for her. I found her standing on our raised pond. Of course this happened at night, but the clear light of day showed what she had been doing – the dried out pond weed on the edge of the pond and ground gave her away. I suddenly realised that whilst I had taught my own dogs that they were not allowed on the edge of the pond, I hadn’t though to teach our visitor. I had just assumed that she would do as my dogs did – what on earth was I thinking of?? 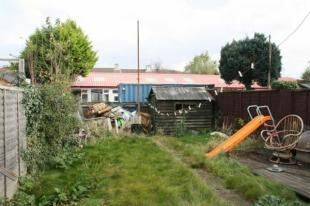 Both are gardens from two bedroom “family” terraced properties and neither garden could be described as large. The houses are on the market at virtually the same price and so are fairly comparable. Which garden is “owned” by the people who live in the house? It is pretty easy to answer that isn’t it? The owners of the garden on the right obviously spend time in it. They value their outside space and want to make the best of it. 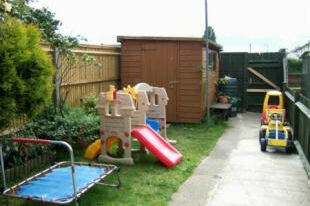 It seems unlikely that the owners of the garden above spend much time in it, apart from possibly the children. If you spend time in your garden, then you are out there with your dogs. You are able to see when they are doing something you don’t approve of and can stop them from doing it. This is easy to do when the weather is good and less so when it is cold or raining. If you are going to spend time in the garden, then it makes sense to do a little bit of work to make it a nicer place to be – and then that way you will want to spend even more time out there 🙂 and maybe even get to relax outdoors. Don’t forget that you need to have ownership of your garden at night too. I have lighting in the garden. These allow me to use the garden at night as well, so not only can I see the beauty of plants (and their shadows) against the backdrop of night but also I am able to see my way to the garage and what the dogs are up to. Other options would be to use torches or “head lights”. So, how do you stop them? I have found that the “Ouch” command is the most effective, but of course the dog has to understand the command. For more on this command see Puppies and Gardens. A good recall is also vital, that way you can always call the dog away from what it is doing. The more you take ownership of your garden then the more you will be able to control the behaviour of your dog in the garden.